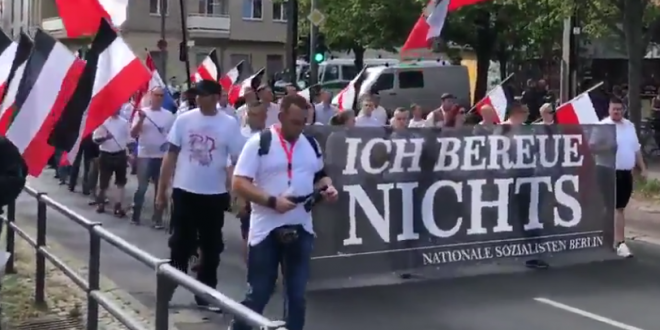 GERMANY: Hundreds Of Nazis March In Berlin [VIDEO] - Joe.My.God. Rudolf Hess, who committed suicide in Spandau Prison on August 17, 1987, was one of Adolf Hitler’s deputies. He was, among other things, responsible for signing into law the so-called Nuremberg Laws of 1935, which deprived the Jews of Germany of their rights. Hess made a dramatic solo flight over the North Sea to Scotland in 1941 with the purported aim of negotiating an end to World War II. He was detained for four years in England, before being sent back to Germany for trial in Nuremberg, where he was found guilty of crimes against peace and conspiracy and sentenced to life in prison. Although numerous appeals for his release were made by his lawyer, his son and even German politician Willy Brandt, Hess remained in prison until he took his own life, aged 93, by hanging himself using the extension cord of a lamp. Earlier this month, German police said 401 anti-Semitic crimes were reported throughout the country in the first half of this year, a 10.7 percent increase from the 362 hate crimes reported in the first six months of 2017.